Engage an experienced teacher and presenter to involve all your teaching staff in a 2 hour workshop during the evening or in the weekend at a time that suits both your staff and the presenter. Choose your focus from the following options. No previous music knowledge is required. Follow up workshops can also be arranged. Cost: $275 per 2 hour workshop with a maximum of 25 teachers. This includes a 2019 year long membership of ONZA. Centres will be responsible for printing handouts provided by the presenter for participants. Learn to sing and play fun songs on the ukulele from traditional children’s songs to the latest hits. Caroline will use children’s books as well as songs making creative use of the ukulele in keeping with the Orff approach. 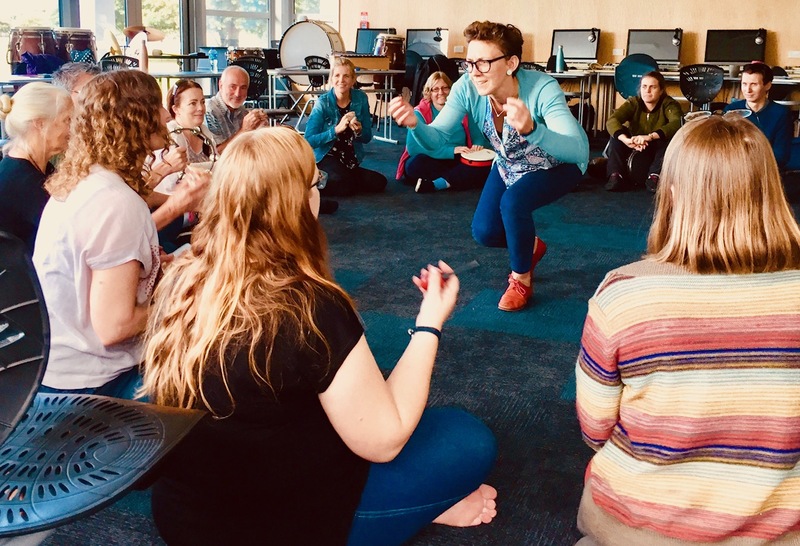 Caroline has worked for many years with early childhood and school teachers , expertly communicating her passion for getting children involved in music and movement through language, always with an element of fun involved. She will show you how the ukulele can be used to enhance your music programme – even if you have learned just 3 chords! Music inspires us to move and dance, and brings joy to the children’s day. Experience fresh ideas as well as the old classics in a fun, supportive environment. Clare is a vibrant and experienced teacher and presenter both here and overseas. She will encourage you in a safe inclusive environment to spread your wings and weave the arts into all areas of children’s learning. We warmly congratulate Clare on being the recipient of a Dance Subject Association of New Zealand 2017 Life member Award. This workshop will explore musical potential found in texts with a Maori theme. Through the use of voice, body, instruments and found sounds, music may enhance language learning, while the use of text may also enhance music learning for young children. Robyn is an expert teacher and presenter who works in teacher education at the University of Auckland. She is a national Kaiarahi for the current Ministry of Education Networks of Expertise venture. For many years she has made access to Maori language and culture an inspiring part of her teaching. This workshop explores traditional and modern Chinese action songs and games with the focus on enriching the musical experience of your children with appropriate vocal techniques, affirming the culture of your Chinese children, or introducing Chinese culture to your class. Edith will share her passion, knowledge and experience with your staff according to their needs.No experience of Chinese learning is required. Youtube links and teaching notes of the songs and games will be provided. Edith teaches Chinese and Performing Arts to 3-11 year olds at Kristin School. Trained in both music education and teaching Chinese to students speaking other languages, she has taught in NZ for 20 years.